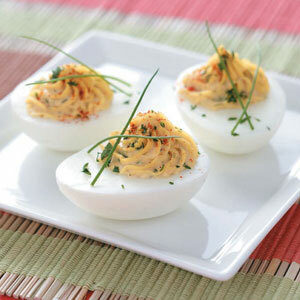 Hard boil eggs, peel, cut in half lengthwise and remove yolks. Rinse whites and set aside. Mash yolks and add crab meat, chives, basil and pepper, then stir in sour cream. Spoon and slightly mound yolk mixture into each hollowed egg white half. Sprinkle each with Old Bay Seasoning.